I’ve always had a lot of time for the charity called the River Thames Boat Project, which aims to introduce people to our wonderful river and to give people – particularly youngsters and the disabled – the chance to spend time on the water. So I was doubly pleased this week when Miranda Jaggers, the lovely lady who runs the project, contacted me to tell me that the Richmond-based charity had hosted a special holiday for ten mothers and children from Belarus who are suffering the after-effects of the Chernobyl nuclear disaster. This year is the 25th anniversary of the accident that continues to afflict hundreds of families. The RTBP took the family groups for a week on the River Thames between Teddington and Windsor on the community barge Richmond Venturer. Most of the children, aged between 6 and 7, are in remission from cancer or leukemia. They came here to spend a few weeks of summer in the clean air of the British countryside, away from their own contaminated environment. The break gives their bodies the chance to fight a lifetime of pain and illness. Community boats are now widely used for special-needs groups and their benefits are well acknowledged. They offer an open-air environment that is at once stimulating and relaxing, and generally stress-free. Adults and children benefit from a closely managed environment, while there is plenty for children to experience and enjoy. 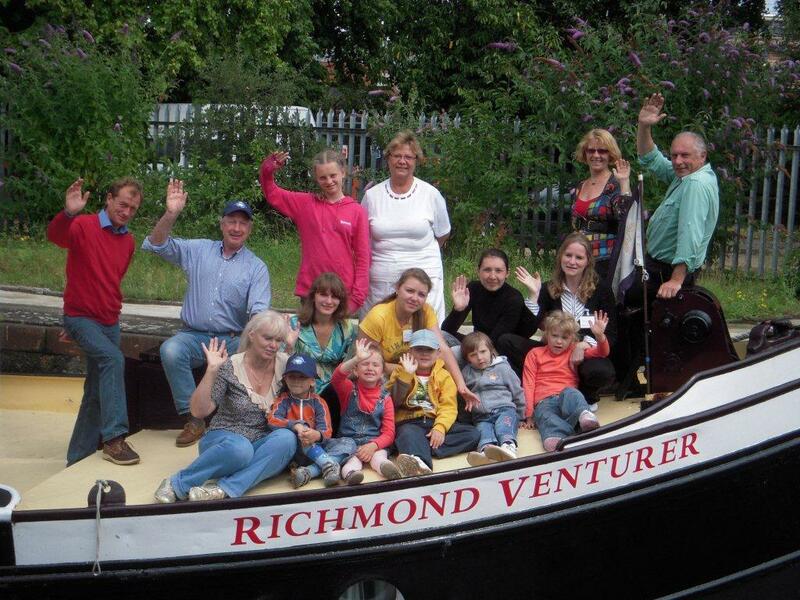 “A week on the Richmond Venturer brought the visiting families together in one place. It gave the children and their mothers the chance to have fun and share wonderful experiences, cook their own meals and develop strong relationships to support them on their return home,” said Felix Borchardt who has been the Chernobyl Children’s Project for 12 years and assisted on the cruise. The appeal to fund-raise for the holiday was supported by HRH Prince Michael of Kent whose charitable interests include disadvantaged children and the maritime. The RTBP regularly run one-day voyages for groups across the whole of our area – along with organising special days for local schools where the Venturer moors up close to the school and the children get to spend time aboard studying the natural environment of the river along with its wildlife. Venturer is a stunning vessel having been carefully converted for the disabled and able-bodied alike and with a raft of aids aboard. It is manned by a volunteer crew under a professional skipper. If you’d like to now more about the project or would like to get involved in some way, call Miranda Jaggers on 020 8940 3509.